In the course of history the texts from the Song of Songs - one of the books from the Old Testament - exerted a great attraction on composers. One reason for this is the expressive language with which the love of a young man and a young woman is described. Another - and probably more important - is the allegorical interpretation of the texts. The young man represented Christ, the young woman the Church, or - especially in mystic circles - the soul of the believer. When the veneration of the Virgin Mary developed she took the role of the young woman. The fact that a number of texts entered the liturgy in the form of antiphons indicates that the Church embraced the allegorical interpretation and considered the texts useful to strengthen the faith of the people. However, one cannot overlook a kind of dichotomy in the Church's attitude: various people who translated these texts into the vernacular came into conflict with the ecclesiastical authorities. Palestrina was one of the composers to set parts of the Song of Songs. His settings were published in 1584 as his fourth book of motets. The first edition's title doesn't refer in any way to the origin of the texts. The popularity of such compositions is reflected by the fact that this book was reprinted several times; later editions are more explicit about their character. In the present recording every motet is preceded by an antiphon, sometimes on the same text, in other cases on a text which is close to the motet in content. This could give the impression that the motets are considered to be written for liturgical use. That is not the case, and the liner-notes mention this fact, although that could have been made more explicit. The antiphons are probably included as a kind of 'liturgical counterpart' to the motets, just to show that texts from the Song of Songs were not banned by the Church. Unfortunately the performers seem not to have realized the consequences of the fact that these motets were written for domestic use or for performance during gatherings of confraternities, closely associated to the Oratorian movement of St Philip Neri. The choir comprises 15 singers. This is not only questionable from a historical point of view; it also results in a largely unsatisfactory interpretation. A vocal ensemble of this size is at odds with the intimate character of the texts and Palestrina's music. These settings are certainly not the most sensitive; some of Palestrina's colleagues probably had more feeling for the specific character of these texts. Other recordings - for instance that by Pro Cantione Antiqua (Hyperion, 1984) - show that more can be made of these pieces. 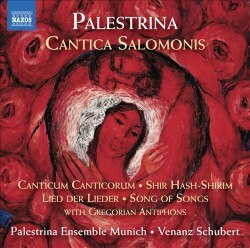 The Palestrina Ensemble Munich is here rather uniform and has too little in the way of differentiation. The transparency of the choir leaves something to be desired as well, and the texts are not always easy to understand. There is more: intonation is often suspect, and the singing sometimes sounds awkward, lacking the fluency required by the stile antico. The balance between the various voice groups is not always satisfying. The German pronunciation of Latin is very odd; I can't see any reason for it, and I suspect that this issue has been given little thought. The ensemble was founded in 1994 and comprises music students from the south of Germany. Without a doubt this makes for a wonderful opportunity for them to sing together and to perform music from especially the 16th and 17th centuries. It is easy to understand that the participants would like to have some memories in sound of their performances. However, the quality of these performances falls short of justifying commercial release. In its early years Naxos released various discs with early music which were of rather suspect quality. In recent years I have heard many which I greatly enjoyed and rated highly, also in my reviews on this site. Recordings like this damage the label's improved reputation as a serious contender in the realm of early music.